July 13th to July 26th, 2004 – Approximately 850 kms. Coastal Cruise??? – Doesn’t sound much like a bike tour, does it? But the fact is that I was cycling a route that required no less than nine ferry rides. The first few days of the tour would send me from my home town of Sidney on Vancouver Island, to the southwest coast of the lower mainland of British Columbia, namely the Sunshine Coast. After which I would return to Vancouver Island at Comox and then continue to the spectacular sands of Long Beach on the west coast of Vancouver Island. From there, I would return to Sidney by riding down the east coast roads of Vancouver Island to Crofton and then hop over to Saltspring Island for my final night before returning to Sidney. Apart from the inland journey to Port Alberni/Tofino, much of the ride will be at ocean-side, or very close to it. Consequently, with many spectacular ocean vistas and coastal towns to meander through, this is a very scenic route to bicycle tour. And even the inland route to the west coast of Vancouver Island will present some classic British Columbia forest and lake scenery. Included in that area is MacMillan Park, which features Cathedral Grove – a spectacular forest containing many huge old-growth Douglas fir trees, some of which are 800 hundred years old, hundreds of feet in height and many feet in girth. Three beautiful lakes – Cameron, Sproat and Kennedy – are the jewels that crown this picturesque ride out to the renowned and sometimes wild waves of Pacific Rim National Park, where thrill seeking surfers challenge the cool waters of the Pacific Northwest. I’ll mention here that I have only added a few photos throughout this blog post of my Coastal Cruise Bicycle Tour, but all my images from this trip are available for viewing by clicking this link. I probably rode about 30 kms more than I should have today, but that’s what I get for detouring through Gibsons and trying to find an alternative route to Sechelt rather than staying on Highway 101. Basil warned me about doing stuff like that! Nevertheless, if my map had been accurate, everything would have been fine, but the damn thing had roads printed on it that were not in existence and other routes shown as through routes that ended up as dead-ends! I seemed to ride in circles for a while, and found myself diligently cursing the mapmaker at every turn that led nowhere. I wasn’t a happy camper for a while, because finding all the mistakes involved lots of short steep hills to traverse in the very hot sunny weather that prevailed all day. Nevertheless, I did find some very scenic areas around the small village of Gibsons that made the extra effort worthwhile. I eventually found my way back to Highway 101 by taking Pratt Road, which was off Gower Point Road west of Gibsons. The small coastal village of Gibsons is definitely worth a visit if touring in this area; as any nostalgic Canadian knows that the long running TV series, “The Beachcombers”, was filmed in Gibsons for many years. 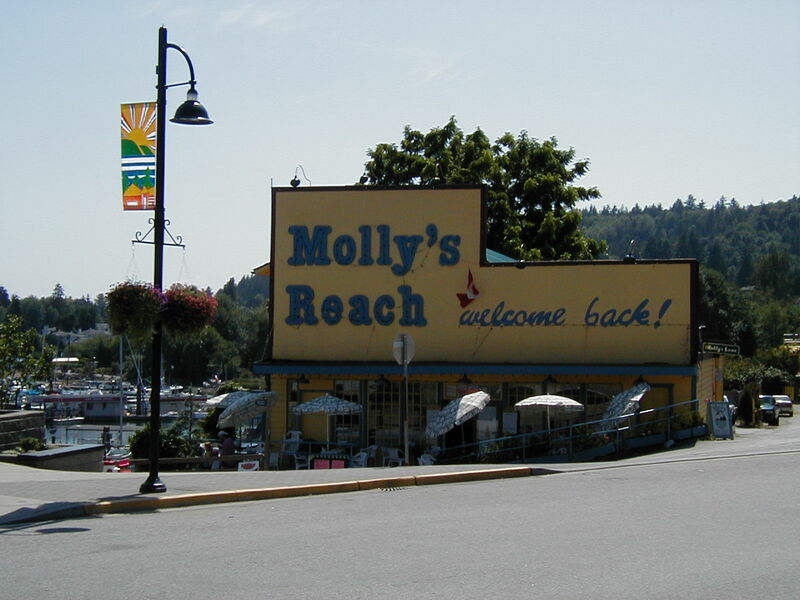 The centrepiece of each episode was “Molly’s Reach Cafe”, which is still a going concern today. The village still maintains its coastal charm despite being a bedroom community to Vancouver. Even though it involves a ferry ride, some people commute from the Sechelt Peninsula to the city of Vancouver on a daily basis. But I’m getting ahead of myself here… The day started early in my home town of Sidney on Vancouver Island, where I had a short 5 Km ride to Swartz Bay to catch the 7:00 a.m. ferry to Tsawwassen on the mainland. The ferry trip takes one and a half hours and is actually quite scenic, as the ferry sails north-east passing closely to many of the picturesque southern Gulf Islands that are dotted throughout the coastal waters of BC. At the terminal I purchase a “Circle Pac” ticket, which would save me 20% on the regular fares for the next four ferry trips (Update 2012 – unfortunately, the “Circle Pac” is no more, but the “Experience Card” does give a generous discount on most routes and free bicycle travel on all routes – available at any ferry terminal). After disembarking from the ferry, I rode the 15 kms to the staging area of the shuttle bus that transports cyclists for the short trip through the un-rideable George Massey tunnel. At least the shuttle has a decent trailer that can handle fully loaded touring bikes. [For details of the shuttle service, click here to link to a Government of BC information page.] Once through the tunnel I followed the recommended route through Richmond and then downtown Vancouver to the Lion’s Gate Bridge. 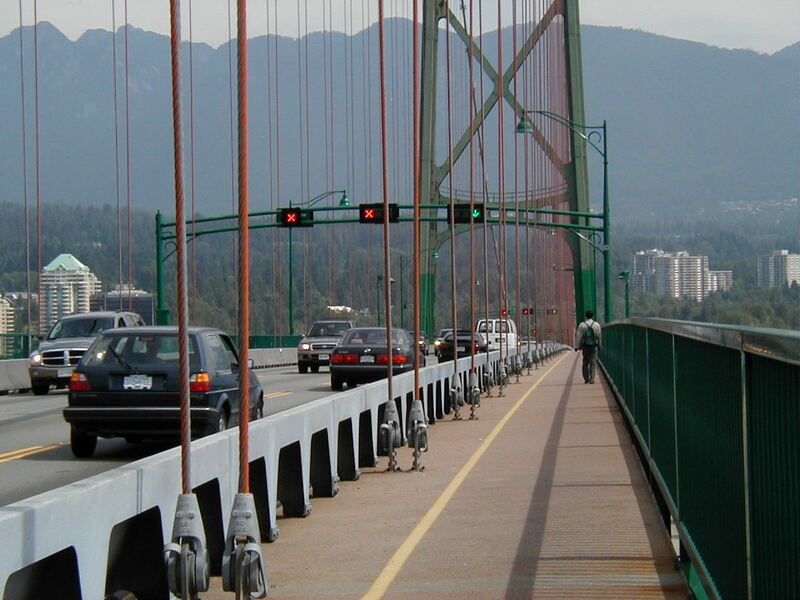 The Lion’s Gate Bridge is a famous landmark of Vancouver and after a multi-million upgrade a few years ago it is destined to remain so for many years to come. The bridge deck upgrade created a wider deck, leaving ample space for cyclists and pedestrians to traverse the span safely. After the bridge I negotiated my way through West Vancouver ending up at the Horseshoe Bay Ferry Terminal, where I would catch my next ferry to Langdale on the Sunshine Coast. At Horseshoe Bay terminal, I had a fair bit of time to kill before the next sailing, so I locked the bike up and wandered down to the village where I knew I could fill my face at one of the many eateries there. An ice cream (or two) was definitely in the plan too; the hot sunny weather and hills of West Vancouver had me sweating up a storm, which left me with a lust for something cold and tasty! The ferry soon docked and off I sailed again for the fifty minute trip across Howe Sound to the Sechelt Peninsula portion of the Sunshine Coast. 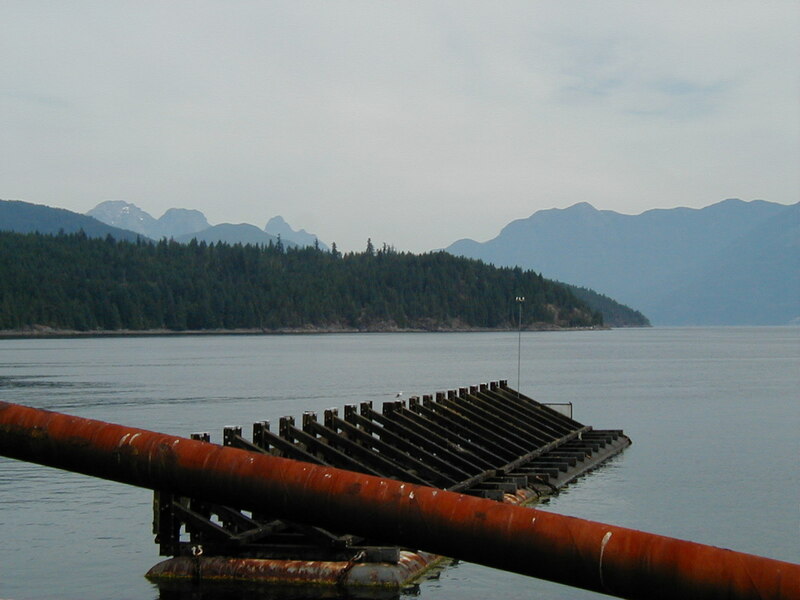 Once off this ferry, I cycled a very short distance on Highway 101 to the first intersection, where I turned left onto Marine Drive heading for the village of Gibsons. I decided to try to explore another route through the village that would lead me back to 101. This proved to be a much nicer ride than just staying on the highway, as I passed many scenic places and rode past some splendid waterfront homes and cottages. Gibsons is well worth a visit for any tourist and even though, as I mentioned above, my map steered me to a lot of dead ends, I eventually meandered my way back to 101 and continued on to the town of Sechelt. I picked up some groceries there(and another ice-cream!) and then rode a few short kilometres to Porpoise Bay Provincial Park,where there is a dedicated cyclists camping area and hot showers to rinse off the road grime of the day. 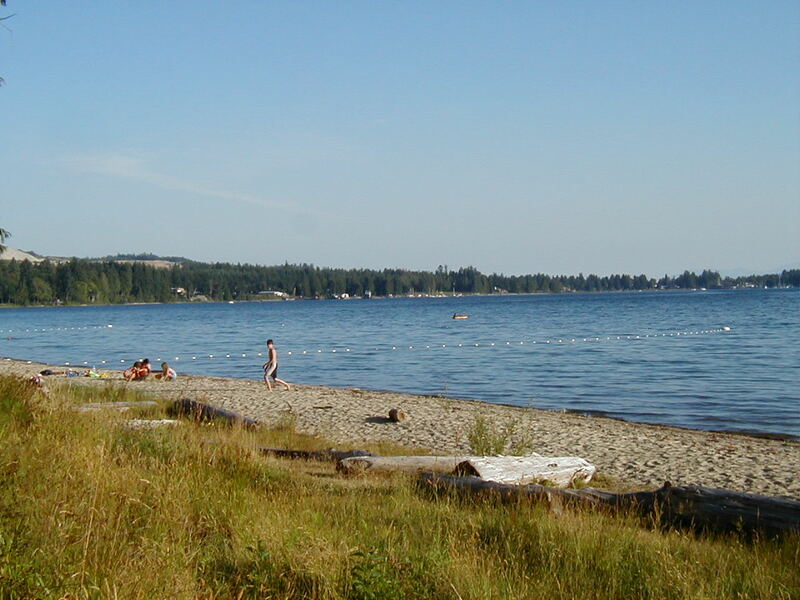 Porpoise Bay is in a beautiful location and has a very nice sand beach with swimming area. I pitched my tent, cleaned up and wandered down to the beach for a while; I was surprised that even though this was mid-July, the park was not very busy. But, can’t complain about that, can we? It was so nice by the water that I grabbed my cooking kit and food from my campsite so that I could utilise one of the many picnic table adjacent to the beach. Waterfront dining – you can’t beat it! The sun was already peeking out when I stuck my head out of the tent, so it wasn’t a big hardship to pack up my camping gear while I cooked up some oatmeal and made coffee. After that I set off for the short 4 Km ride back to the village. I just had to stop at the McDonald’s there for a cup of fresh java and a muffin. Fully satiated, I started my ride north on Highway 101. After about 8 kms, I came to the junction of Redroofs Road, which on my map presented itself as an off route scenic diversion. I was still miffed at my map steering me wrong yesterday, but nevertheless decided to take a chance on this side trip. The map didn’t fail me this time, and the slightly longer route along Redroofs Road took me past places such as Sergeant Bay PP, Reception Point and Welcome Beach. Although hilly, it was a very nice diversion with some scenic vistas along the way. 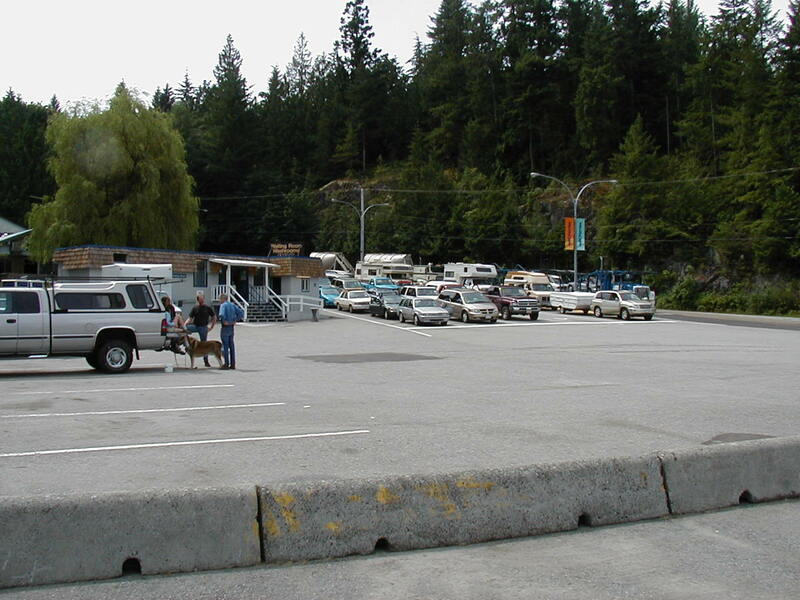 Shortly after I rejoined Highway 101 for the remainder of the hilly sixty-odd kilometres that are required from Sechelt to reach the ferry dock at Earl’s Cove. The hills were a bit of a grind, but only because the sun was giving out some major heat again. I arrived at Earls Cove and was quite happy to be early for the next ferry, as there was a little cafe at the terminal where I quenched my thirst and generally restored my depleted carbohydrates with a good lunch followed by some apple pie and ice-cream – life’s good ain’t it? I only had a short wait after lunch before the ferry arrived and soon I was off on the fifty minute sail to Saltery Bay. Once off the ferry, I waited a few minutes for the traffic to disperse itself ahead of me and continued on in the heat to battle a few more hills of Highway 101 on the way to Powell River. Saltery Bay Provincial Park is 2 kms from the ferry terminal, and the longest hill also starts not too far up the road from the ferry terminal – I remembered it fondly from previous rides to this area! There were some road works to contend with too – actually it wasn’t so much road work as hydro crews installing new poles and cables, but I still had to stop for flaggers a couple of times. But at least that gave me an opportunity to catch my breath! Otherwise, it’s not a very long ride to Powell River and there are not too many opportunities for refreshments, notably the best stop is the Black Point store – at about the halfway mark. Westview is the first neighbourhood of Powell River that one arrives at when heading north on 101. In fact, there are quite a few different areas that combine to make up Powell River proper. The original town is north of Westview and is known locally as the Townsite. It is the location of one of the largest pulp and paper mills in BC and the area where the river (that the town is named for) was dammed to form Powell Lake. The dam was built to provide water for the mill operation. Riding into Westview along the waterfront is always a nice treat. For a short stretch of downtown Westview, Highway 101 becomes Marine Avenue, where shops and restaurants are readily available for hungry bike tourers like me! Willingdon Beach Campground is just a short distance further along this route and is where I arrived, ready for a shower and some grub. After the hot day’s ride, the shower was very welcome, after which I ventured back into the shopping area for some supplies and an ice-cream or two. When I returned to my campsite, there was a German fellow setting up camp nearby. He was an older chap and had also cycled in on a ratty old mountain bike. I struck up a conversation with him and discovered that he had been on the road for a while and ridden that “ratty” bike all the way from the Okanagan – a distance of quite a few hundred kilometres! I also discovered that he was a minimalist – no tent, just a tarp on the ground under the seat of the picnic table and one of those shiny space blankets for a body cover. I think he used some of the foil covered bubble wrap for a sleeping pad. He had one pan that he used to cook over an open fire, gathering just enough small twigs to prepare his food and heat some water. Everything that he had packed into the small backpack that was his only luggage – amazing! I felt somewhat spoiled by all the gear that I carry to ride, camp and eat, but I must admit that I like my creature comforts. And regardless of the extra weight, I am not willing to leave things at home that might enhance my experience. Nevertheless, I gathered from his attitude and demeanour that he was having just as good a time cycle-touring as I was. With a very short riding day planned, I slept quite late and broke camp at a leisurely pace. Next item on the agenda was breakfast, and as I had lots of time, I opted for a cooked breakfast at the Jailhouse Cafe – actually located in the old Powell River Police building – another part of the vacated cop shop is occupied by the travel information centre. The sun was out again, so I enjoyed my breakfast on the outdoor patio of the cafe whilst watching the comings and goings of the Powell River townsfolk. Well, I couldn’t lounge around forever, so I saddled up and set off to find the trail from Willingdon Beach to the old Townsite. This trail saved a bit of a climb on Highway 101 leaving Westview; it’s just a dirt trail, but quite wide, well packed and frequently used. There are displays of old logging equipment and information plaques along the route. The trail narrowed a bit after crossing a road and I came to a “Y.” I took the left fork and ended up at the back of the mill’s administrative buildings where there was a road on the right leading up a short steep hill to Highway 101. At the top of the hill, I turned left and started out north on Highway 101. It’s a short ride through the old Townsite, but there are a few opportunities for restaurants and convenience stores in the neighbourhood. The highway runs parallel with the river, but it’s a short trip – the river is listed as the second shortest river in North America! A bridge across the river is located not too far north of the Townsite; Powell Lake appears from the west side of the bridge. Just after crossing the bridge begins a short steep climb with a couple of hairpin bends thrown in – it’s posted at 13% grade, so I was doing a bit of huffing and puffing on that climb! At least there were occasional views over Powell Lake to keep me motivated, and the trees along the route provided some shade from the hot morning sun. At the top of the climb is the neighbourhood of Wildwood where, once again, some basic amenities are available. The road from Wildwood to Lund, although short, is narrow, hilly and winding, but not particularly busy dependant on the time of day. I rode at a leisurely pace and enjoyed the views over the Strait of Georgia whenever possible arriving in Lund at about lunchtime. I almost felt guilty at having lunch after such a short ride – I did say “almost” though didn’t I? There’s a terrific bakery/cafe at the road’s end in Lund, and that’s where I decided to park for a while. I said “road’s end” and many other people say that Lund is the end of Highway 101, but the locals say that Lund is the “beginning” of Highway 101! For accommodation, there is nice campground in Lund as well as the upgraded hotel/pub. As the weather was still perfect, I opted for camping. The ride to the campground involved leaving the Lund waterfront via the short steep hill back south along 101 and turning right at the top of the hill. The campsite is on the bluff overlooking Lund boat harbour; although a very short walk from the camping area is required to actually see the ocean. I set up camp, got cleaned up and took the footpath back to the village. 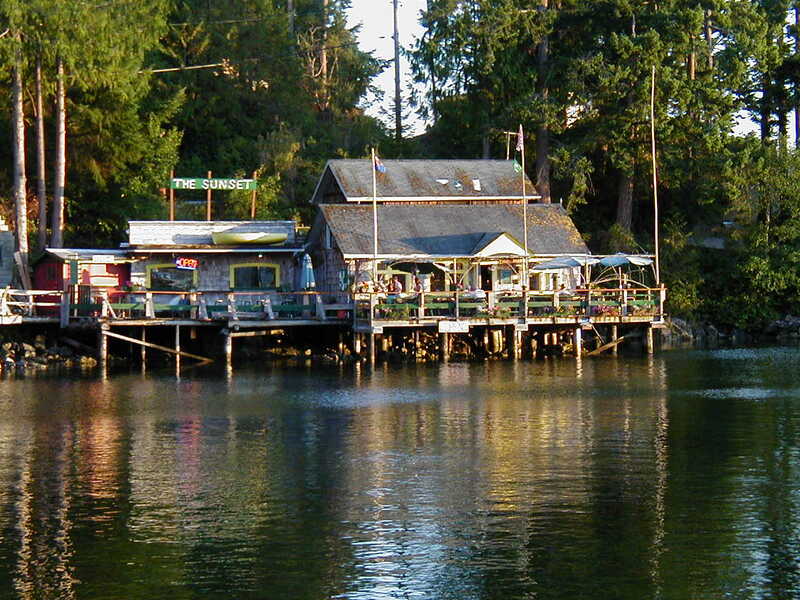 On the route from the campground there’s access to a rickety jetty where the charming Sunset Cafe is located (literally) on the waterfront. Lund is a beehive of activity in the summer months, with boaters from far and wide sailing by on their way to Desolation Sound Marine Park. Lund is a boaters’ last stop for fuel and supplies, hence the jetties are busy from dawn to dusk. The village general store also racks up some good business from all the visitors, and is very well stocked with a vast array of merchandise. The hotel/pub overlooks the jetties where one can spend hours watching the antics of the boaters coming and going – and in fact, I did! This entry was posted in Cycle Touring, Gulf Islands, Home, Saltspring Island, Sunshine Coast, Touring Journals, Vancouver Island and tagged Alberni Inlet, BC, Chemainus, Comox, Ganges, Gibsons, Highway 101, Horseshoe Bay, Long Beach, Lund BC, Parksville, Port Alberni, Powell River, Ruckle Provincial park, Saltspring Island, Sechelt, Sidney, Texada Island, Tofino, Ucluelet, Vancouver on August 1, 2004 by AdamK's Cycling & Travel. You should tell me next time of this dirt of trips. NINE ferries?! I love cruising on ferries…!